“We wanted to showcase SundaySky’s innovative technology and create a brand that better aligned to representing the pioneering nature of its business,” stated Mario Natarelli, MBLM’s managing partner. MBLM, the Brand Intimacy Agency focused on strategy, design, creative and technology, today announced it has successfully created an extensive brand program for SundaySky, a company powering personalized video engagement for leading brands. SundaySky is a technology vanguard, reinventing the relationship between brands and customers through personalized video. Since 2011, SundaySky’s SmartVideo platform has generated more than 500 million personalized videos, rendered in real time for blue chip customers, such as AT&T, Comcast and Allstate. Working closely with the management team in New York and Tel Aviv, MBLM first focused on SundaySky’s brand essence. Utilizing its Brand Intimacy insights, MBLM positioned the brand around the archetypes of enhancement and fulfillment, crafting the powerful notion of “The Audience of One,” highlighting how SundaySky enables companies to engage with and communicate to an individual customer on a one-to-one level. MBLM also created a new SundaySky identity, system and templates featuring a modern design with dynamic flexibility, again alluding to the constant customization and variability the brand’s product delivers. The agency redesigned and rebuilt SundaySky’s website. The concept of the site centered on demonstrating the technology company’s ability to personalize meaningful messages to a singular audience through the power of video. This was achieved through the extensive use of video case studies, relevant content served based on the user’s navigation, and marketing automation to convert prospects. “MBLM was a very strong partner, understanding our business, the technology space and what a brand needs to be distinct and relevant. The team came up with a great strategy, powerful design and sophisticated website that surpassed our expectations,” noted Jeff Hirsch, chief marketing officer of SundaySky. 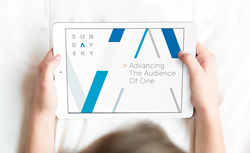 About SundaySky: SundaySky is transforming the relationship between brand and customer through personalized video. Our platform, built on proprietary SmartVideo technology, combines the power of video with personalized storytelling at scale to foster long-term customer relationships. The SmartVideo Platform lets marketers communicate to an audience of one and easily create, manage and optimize real-time personalized video programs throughout the customer lifecycle. AT&T, Comcast, Allstate and other industry-leading brands partner with SundaySky to engage prospective and current customers, resulting in higher revenue, lower costs and deeper loyalty. SundaySky is headquartered in New York City with offices in Tel Aviv and Tokyo.